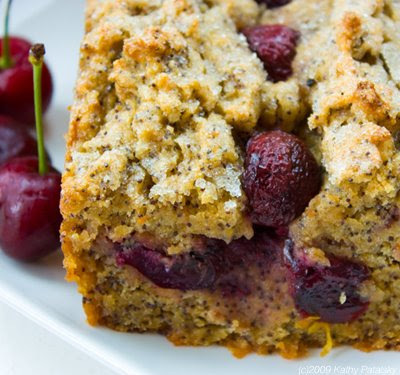 Sweet Cherry Orange Peel Poppy Seed Loaf. Vegan. 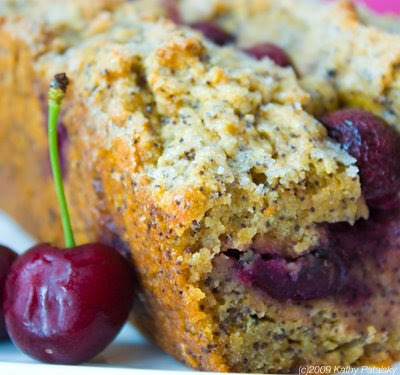 Sweet Cherry Bread. I've already discussed cherries. And yes, they are worth the price for a special treat. So now lets get a little creative before those $8 a pound cherries go bad, and make a yummy tea cake loaf. I take my favorite bread lemon-poppy seed and twist it up a few orange zesty degrees. And did you know that poppy seeds are high in calcium. Just another bonus to this healthy treat that tastes like summer brunch. Combine soy milk, oil, agave syrup, sugar, poppy seeds, vanilla extract and orange juice in a large bowl. In a separate bowl, combine flour, baking powder, xantham gum, salt, orange zest and cinnamon. Stir dry ingredients into liquid ingredients. Stir until you have a well blended thick batter. Top with a few leftover cherries. Serve warm or store at room temp for a few days. Freeze slices for prolonged tea cake enjoyment.